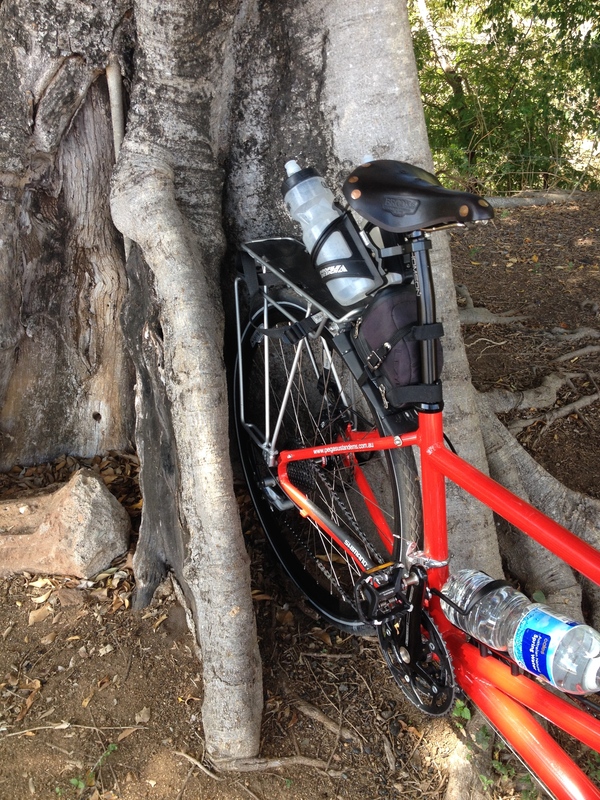 The weekend was hot, there were mega headwinds on the second day and the Giru pub didn’t serve meals on Sunday nights. Despite these minor challenges, our 310km cycle touring journey over the October long weekend was fantastic. We set off at 6am on Saturday morning; our first stop planned for the Calcium BP Roadhouse where we knew from last time we could get a good bacon and egg roll and a coffee. It was pleasant rolling along in the morning cool at a steady 21km an hour. Our memories of how heavy it is to push a loaded tandem had faded a little since last time and this speed was about all we could manage. 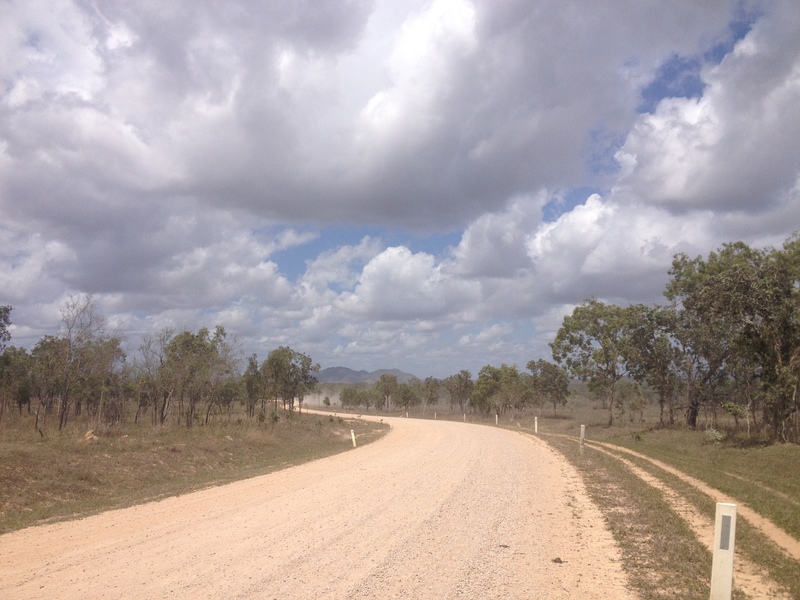 One of our friends accompanied us the 60kms to the roadhouse then turned back to Townsville into a quality headwind, while we enjoyed a tailwind for the next part of the journey. Traffic was good and we didn’t feel too bad when we reached Mingela 25kms later at the top of the Mingela range. 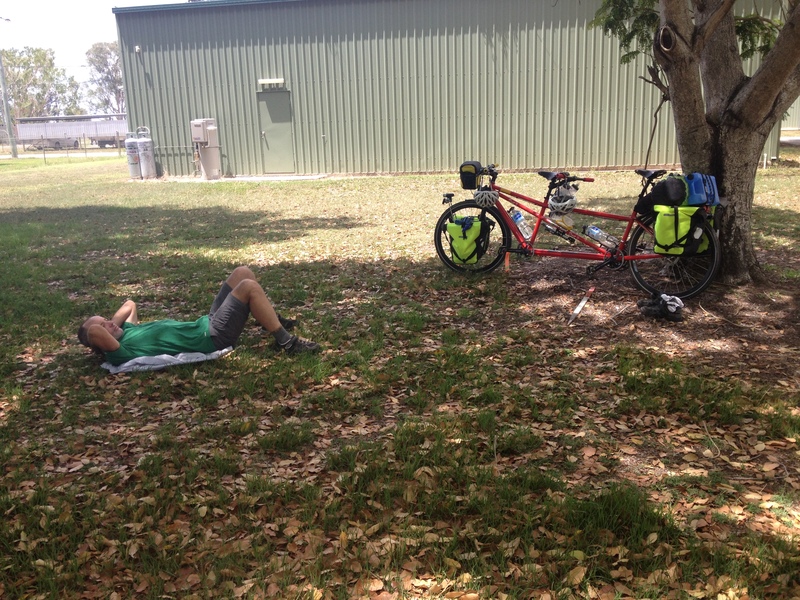 For some reason we parked outside the toilet block, probably drawn by the shade and wall to lean on. We don’t recommend it unless you’re wearing an oxygen mask! The toilet block inspired us to push on a bit before we ate anything. We had a peanut butter and honey wrap (or PBH in honour of our friends Beasts in Jungle who came with us on our last trip). 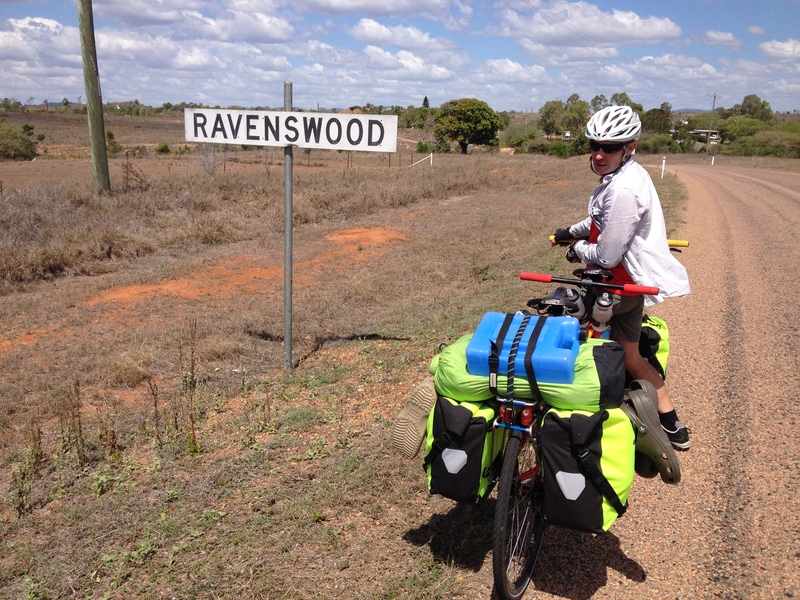 The last 38km from Mingela to Ravenswood was pleasant enough, although we were looking forward to resting our legs, out of practice with long days on the bike. There were a few undulations and some lovely green areas on the sides of the road which made us feel like we were riding in parklands. We rode into Ravenswood at about 2pm. 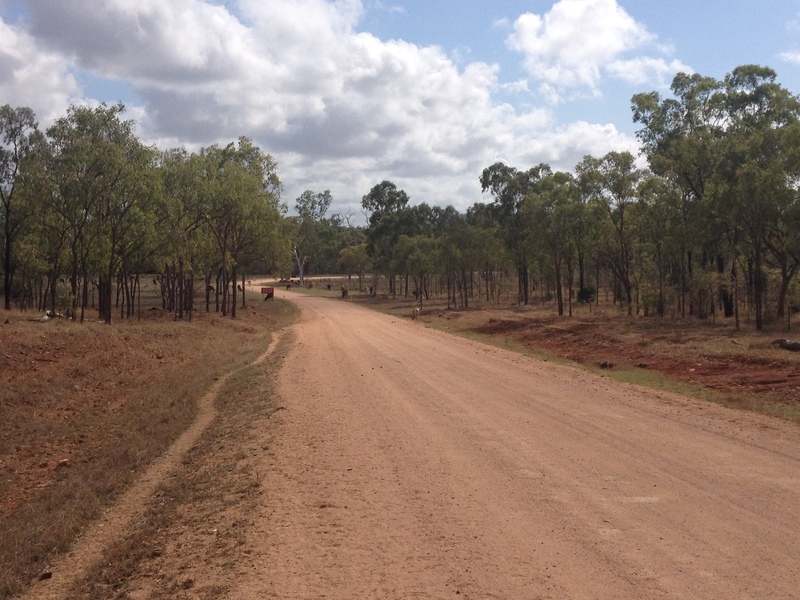 The council campground is just over 300m from the main part of town and had plenty of shady areas around the edge. 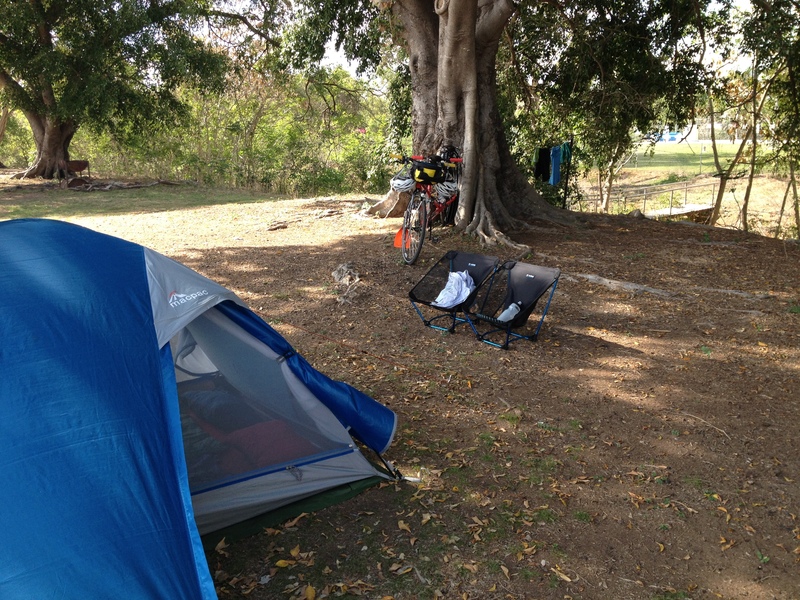 The caretaker waived the $15 a night fee on account of us being cycle tourers and we set up our tent under a tree with a convenient bike rack. 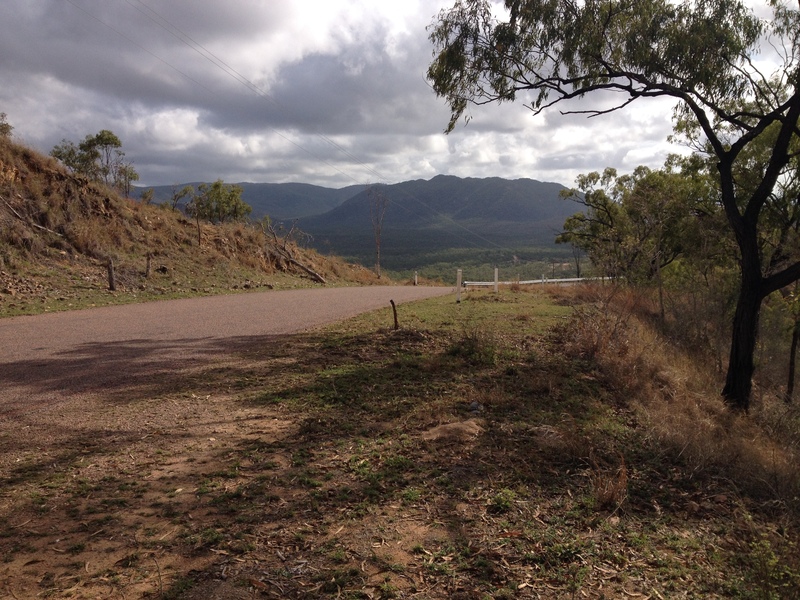 By 3.30pm we had set up camp and showered and were ready to head to the pub for a feed and a chat with the locals about the history of this old gold mining town. The kitchen in the pub didn’t open until 6pm and the young women behind the bar were German backpackers on a short term contract, but we enjoyed crisps and a beer before setting off to check out the old buildings and cemetry. The town is very interesting and well worth spending another day to check out the museums that are only open 11am – 2pm. The general store is open later though and we bought some more snacks to get us through until dinner! 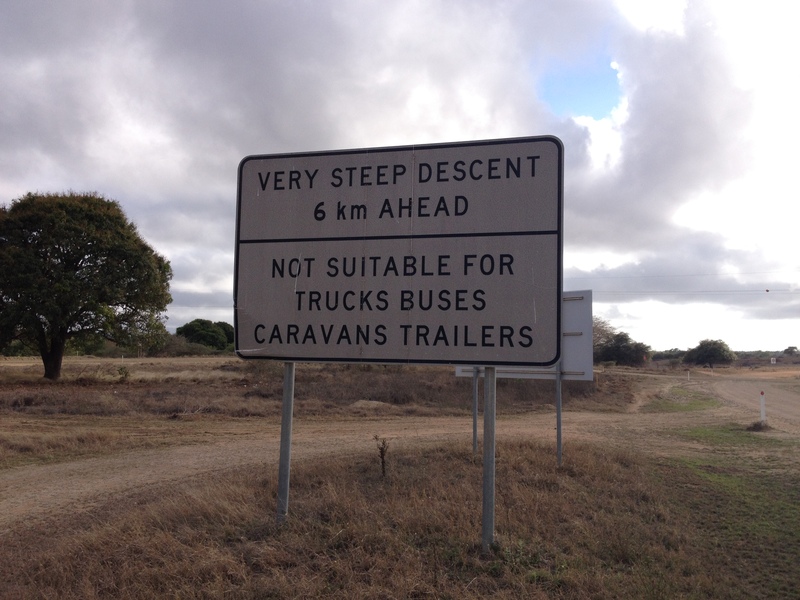 We were slightly worried until we saw the next sign which told us the descent was only 11%, small fry for ex-Tasmanians! This road was the best part of the trip. It was a bit bone-shaking at times (well, a lot), and we wished we had fat tyres (we had 35mm Schwalbe Marathons fitted), but the scenery was spectacular and the cows were friendly! It was hot and dry and the oranges were good. We preferred riding to standing still because at least when riding we sweated and created our own airconditioning, particularly with the long sleeved cotton shirts we were wearing. 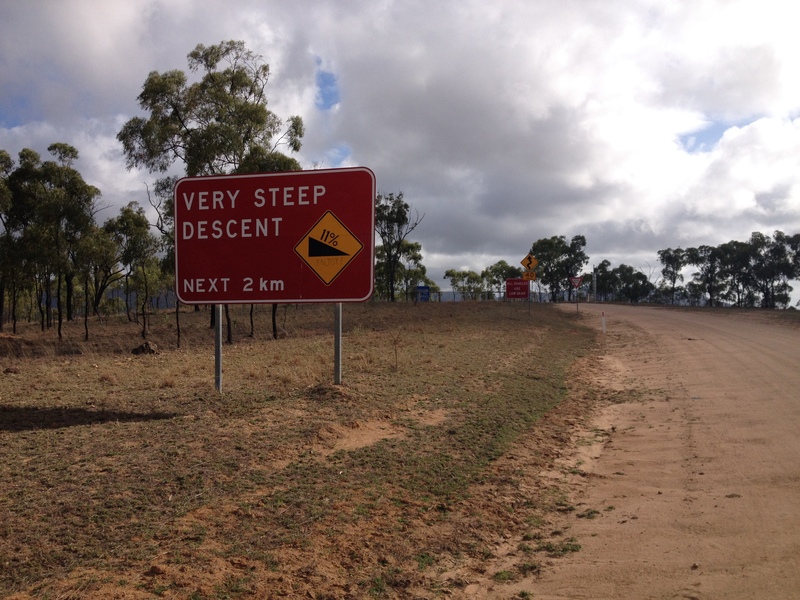 Getting to Giru, only another 40kms on, felt a bit torturous. We still had a headwind, no matter which way we turned, and were lucky to hit 20kms an hour. 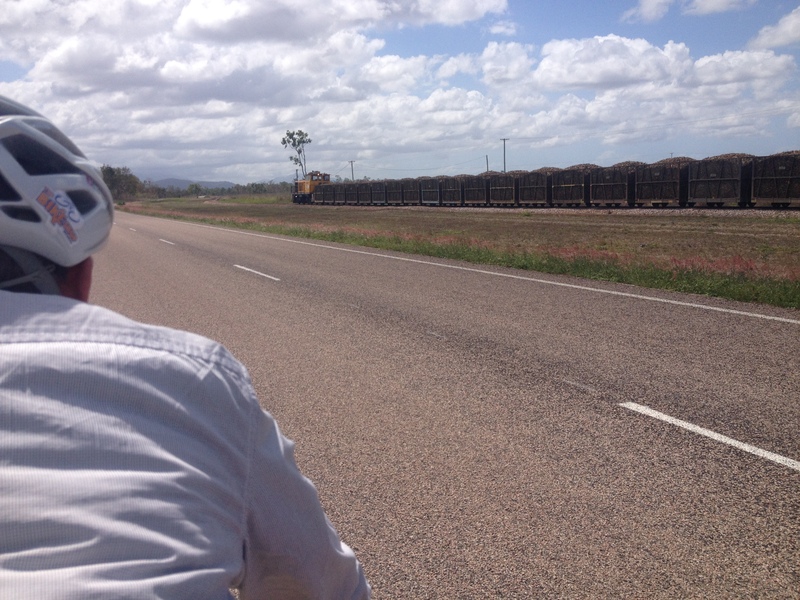 Highlights consisted of stopping at a level crossing for a sugarcane train and attempting to race one that passed by. The train did help block the wind a little and we were disappointed when it stopped not far down the way. For some reason we thought the Giru International Hotel would sell hot chips on a Sunday afternoon, but it wasn’t to be. For future reference, the pub’s kitchen doesn’t open on a Sunday night. Lucky we had planned to cook our own meal anyway, and along with some green beans bought from the general store, we had a feast of tuna curry and gingernut biscuits. Giru has a lovely grassy area behind the sugar mill where you can camp for free. There are no showers and the public toilets are a good couple of blocks away, but there is water across the road at the fire station and who needs showers anyway! 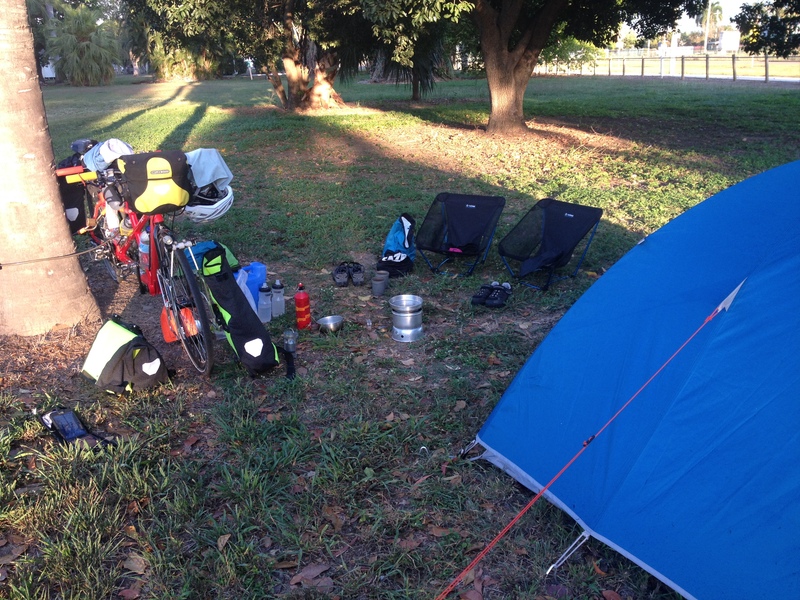 We found out about this camping area from Wikicamps, an app some fellow cycle tourers told us about a few months ago. It was pretty quiet (except for the trains and sound of the mill) and the ground was soft to lie on. 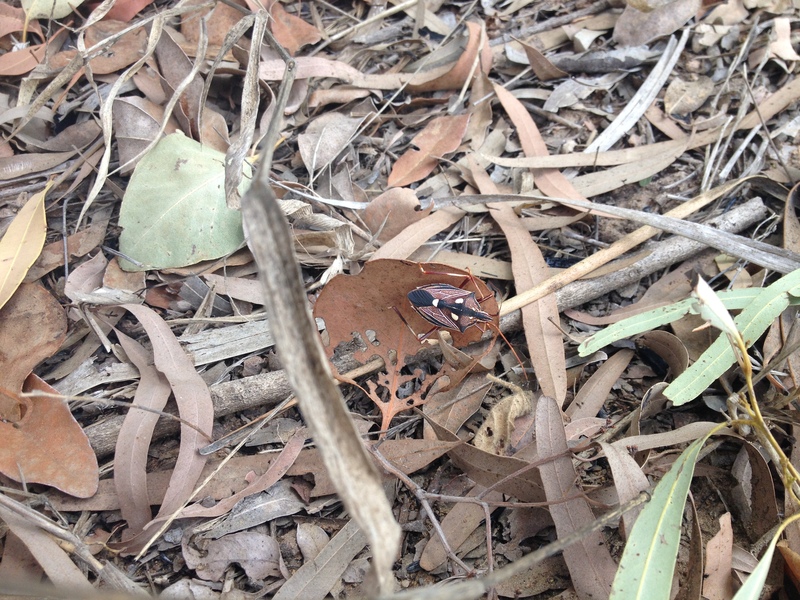 There was even a special big spider in the stoker’s shoe the next morning. Not surprisingly there was no time to get a photo! We left Giru on Monday morning, a public holiday, and headed to Woodstock, 40kms away. 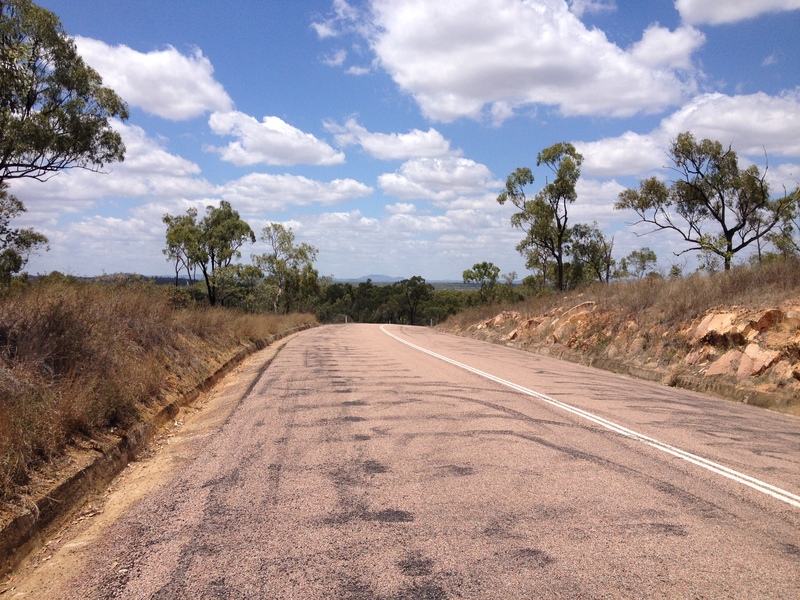 Giru to Townsville is only about 55km if you travel on the national highway, but we wanted to avoid that if possible. The road to Woodstock was quiet and beautiful. 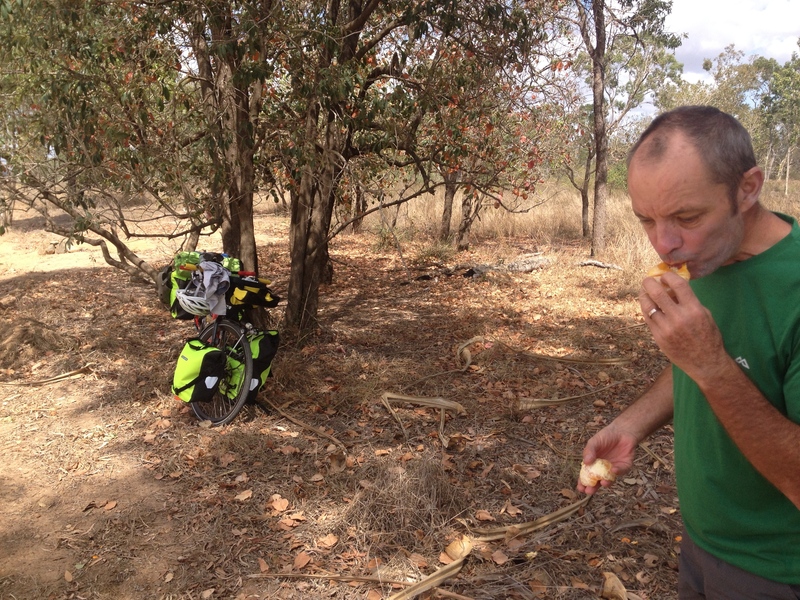 We rode steadily and had a quick break on the side of the road before getting back on the bike for the final 35kms to home. 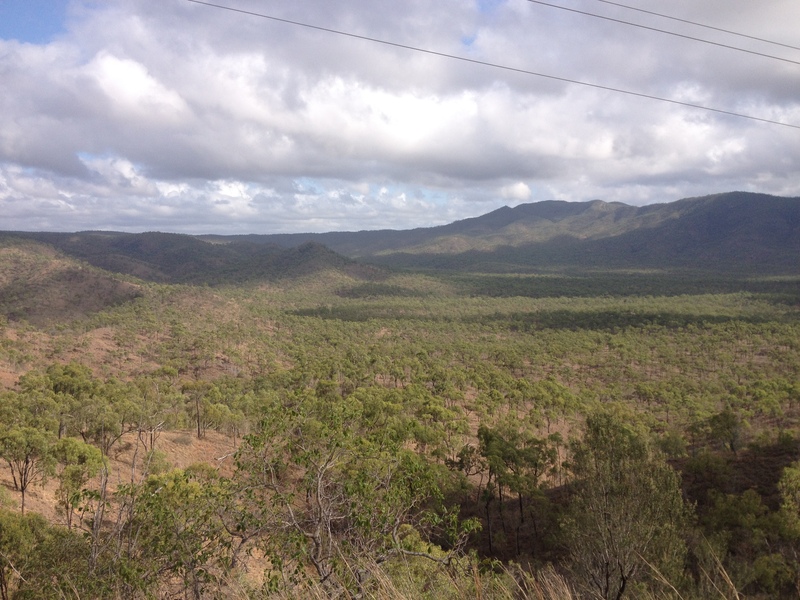 The tailwind from Woodstock to Townsville is well known if you’re early enough. We enjoyed it in spurts depending on the curves of the road and were grateful for the little help it offered. Our trip was finished by midday on Monday. 310kms, heat, headwinds, boneshaking gravel and pubs with closed kitchens…it was a fantastic weekend and we can’t wait for the next one! 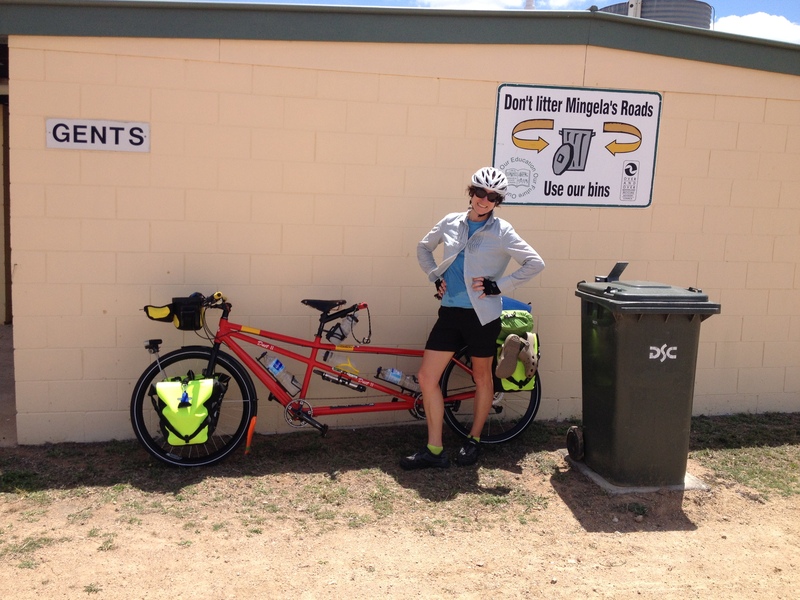 ← October long weekend cycle touring adventure!